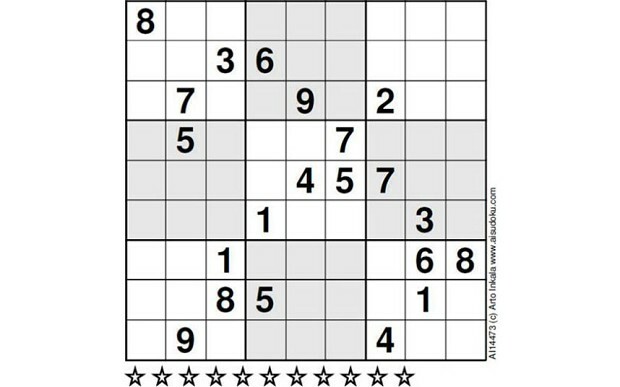 Solve this Sudoku. Post how you did it in your answer. Enjoy! Note: I put this program into the solver on sudokuwiki.org and it couldn't find any numbers. I then gave it cell H7 (the only cell with two possibilities) and still no luck. Then I gave it cell G7 (which became the only cell with two possibilities) and it was only able to solve one cell before it got stuck. 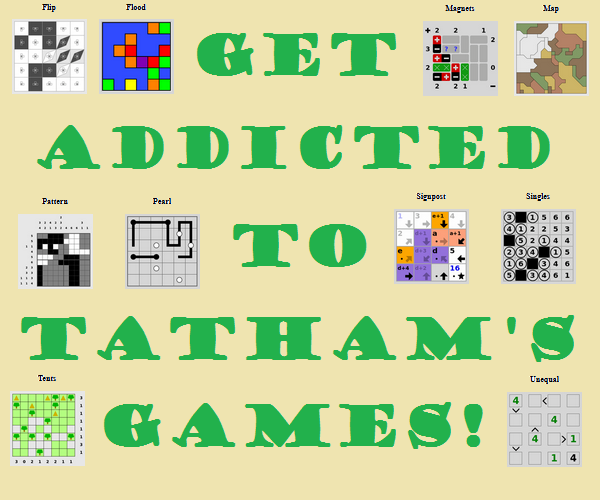 Here's the website of the mathematician who discovered this puzzle. Guessing single values in a depth-first search is sub-optimal. So, here is a reasoning chain based on a breadth-first hypothesis/disproof method (which my stepson reluctantly calls "educated guessing"). Just following the chain including contradictions requires to solve 23 variants of the sudoku, so it's best used with a computer aided solver. However, it does not require any fancy algorithms to follow it. (I use my own home grown unoptimized python program, so there is no real computing power involved either). The notation follows spreadsheet conventions (column = letter, row = number) (or chess if you will). I have put up screen shots of the steps and a quick explanation of the method at World's Hardest Sudoku. 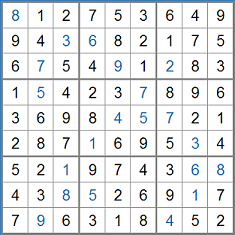 Since I am only interested in solving hard puzzles by "educated guessing", I found that this sudoku is actually not so hard as advertised (1 level of hypothesis + 1 lookahead = 2 levels of hypotheses). In fact, I have not yet found a sudoku that requires more than 2 levels of hypotheses + one lookahead (= 3 levels of hypotheses). For this puzzle, while it has one and only one solution, no known patterns work on it, other than a slightly more intelligent guess-and-check. The number of steps one has to look ahead in order to reduce away clues is the metric here, and this puzzle needs nine sequential guesses to reach a solvable state. This solver could not solve the puzzle completely by logic, this does not mean there is not a logical solution. and then promptly fails to list any of the steps it used to solve it. This only happens when the solver must use brute-force branching guessing to find the solution. As a result, there is no way I myself could reasonably provide a "how to solve this puzzle" answer, since doing so would involve finding these specific chains and explaining why the other vast quantity of chains don't work. But that's how you do it: assume a square is a number, then another, then another, and keep checking until you've come to a sequence that still makes sense and allows you to solve the puzzle, or you've come to a contradiction and need to back up and try again. I'm afraid I think this is the best answer you can get to this question. Apparently it is possible to solve with logic, though, according to the guy who invented this puzzle. It just took the solvers 24 hours to do it. Note: This puzzle has the 1 on the 7th line in a different position as the question's. This puzzle has multiple solutions. elseif c mod 3 = 0 then " | "
And using the default solver on a fairly standard laptop the solution comes out in 100ms, which does beat PM Lee's C++ implementation by a considerable margin.